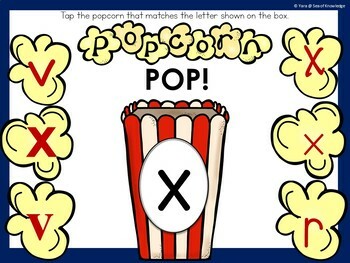 Boom Cards Bundle Phonics, Reading, Counting, Life Skills, Math and More! 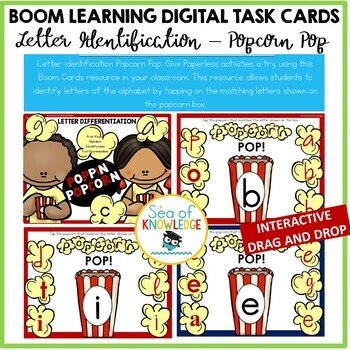 This 24 Digital Boom Card Alphabet Identification Game gives the students the opportunity to practice visual letter discrimination. Students find and tap on the matching letters found on each slide. 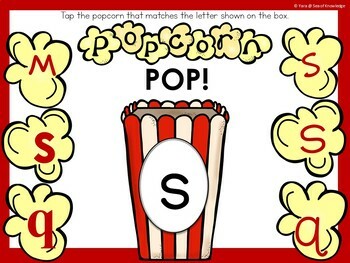 This would make a great literacy station or morning work activity. There are 24 game slides in this activity deck which feature tappable objects. Popcorn theme. If you haven't experienced task cards in this format, I highly recommend that you check out this activity! It's super engaging and very unique! The best part about it is that you can use and re-use the slides as many times as you need to and on so many supported devices. To use Boom Cards, you must be connected to the Internet. Boom Cards play on modern browsers (Chrome, Safari, Firefox, and Edge). Apps are available for Android, iPads, iPhones, and Kindle Fires. For security and privacy, adults must have a Boom Learning account to use and assign Boom Cards. You will be able to assign the Boom Cards you are buying with "Fast Pins," (play provides instant feedback for self-grading Boom Cards). Fast Play is always a free way for students to engage with Boom Cards decks. For additional assignment options you'll need a premium account. If you are new to Boom Learning, you will be offered a free trial of our premium account.Readhere for details: http://bit.ly/BoomTrial.